Prize Bond is the lawful method of earn money and become rich overnight. Prize Bond scheme give golden chance to fulfill one’s dreams. Many prize bond holders have different types of National Saving Prize Bonds. 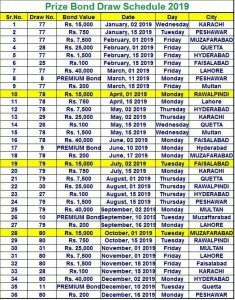 The prize bond lucky draw is held on quarterly basis, Government of Pakistan Central Directorate of National Savings announced Prize Bond schedule at beginning of every new year. 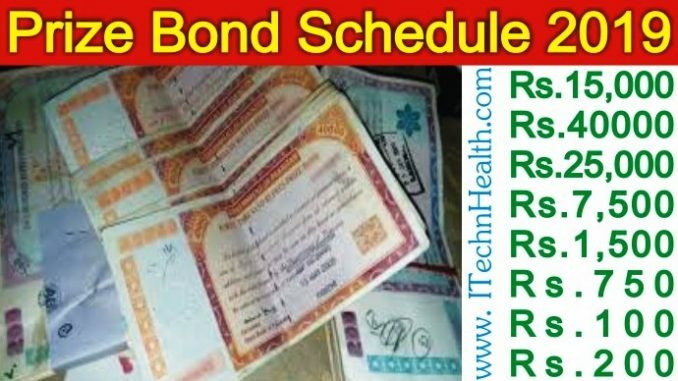 Here you can find the complete schedule list of all prize bond draws worth 100, 200, 750, 1500, 7500, 15000, 25000 and 40000 respectively for year 2019. In case draw fall in public holiday the draw will be held on next working day.